On this Gallery, you can tour a selection of rugs from our last Exhibition, held in September 2017 at Centennial Hall. 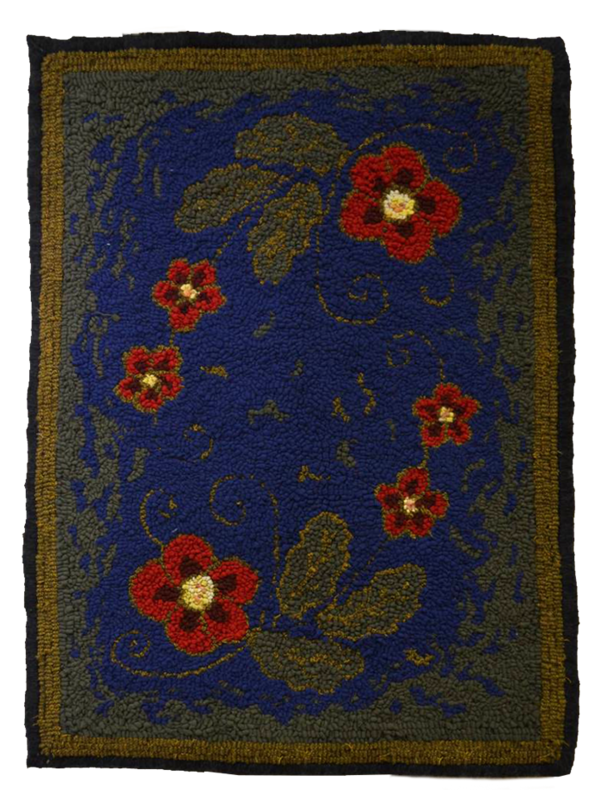 Visit our Blog to see the rugs showcased in the past. I used various types of wool, such as woolen fabrics cut in No 6, yarns of different colours and textures, as well as velvet. I began hooking in January 2016. After finishing my first rug (18” x 11”) I took a course with Lois Morris at the Guild’s Monday hook-ins to learn how to dye my own wool. Of course, I decided the next thing I should do is hook a piece using wool that I had dyed. The challenge apart from the dyeing was to hook a building and a stormy sky. This would be a practice piece and not necessarily a finished rug. Once I had the barn and trees done, I started the sky. While working on the sky I literally got hooked on this rug and decided to take it to completion and so the wild flowers were added in the forefront. There are 38 colours in them. Both the sky and flowers were done in a spontaneous manner, the colours and shapes chosen as I ‘painted’ with the wool. It was certainly a challenge and an incredible learning experience. Four Houses, Hooked By Emmy Maten. This is my first rug, a kit I purchased at Deanne Fitzpatrick’s studio in Amherst, NS, while travelling through the Maritimes in the summer of 2017. I enjoyed the art so much, that when I consequently heard about the BHCG, I eagerly joined right away. 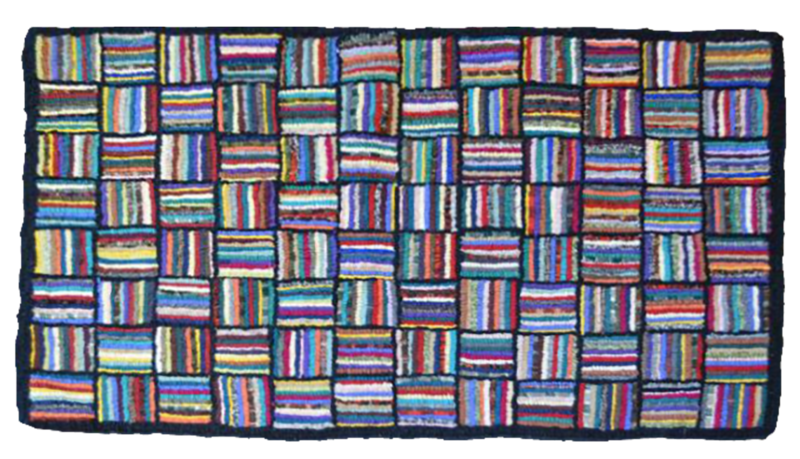 The rug was hooked with 6 mm wool strips and some wool yarns for the sky and window frames. In 2013, on a visit to Prince Edward Island, I discovered hooked rugs, their beauty and how they were made. In a local store specializing in hooked rugs, I bought a pre-printed pattern, as well as the wool needed to complete the rug. On my return, I joined BRHG so I could learn how to hook a rug and get skillful enough to get it done. The members of the Guild were very helpful in guiding me in the different steps required to make a rug, and I was finally able to finish my first rug. 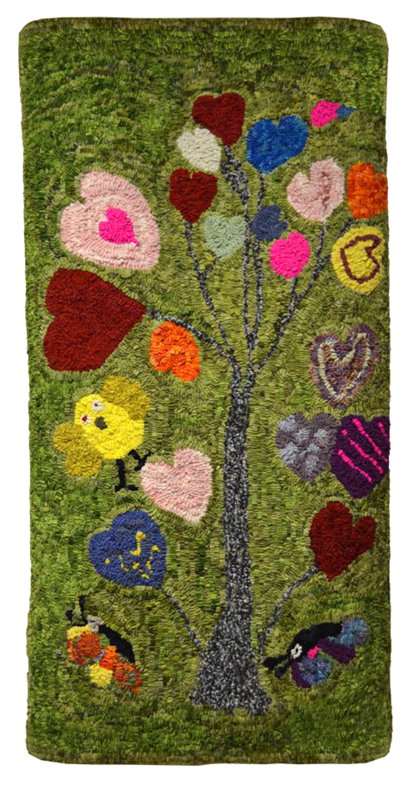 This rug was inspired by a tree shown in the Adzif collection of wall decals. I got the fabric for the tree in a store on St-Hubert street and bought the wool from Judith Dallegret. I used a # 8 cut. Since it was intended for my grandchildren 's playroom, it was named L'Arbre de mes amours. 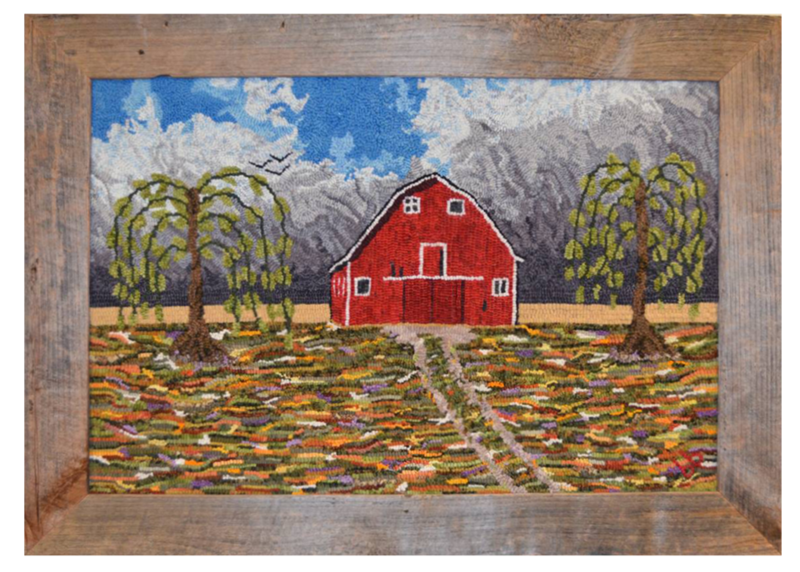 This was my first rug hooking project. I used mostly #8 cut , but some of the recycled fabric was really thick and I used a #4 cut. The yellow stripe, for example, is in this cut and is used to brighten things up. Before I tackled this project I had been working on a scrap of backing trying to teach myself how to hook. I had seen this Hit and Miss design at rug hooking shows and liked the colourful result, so I thought it would be good practice getting the loops even. This was an ambitious project for a first effort and I was struggling to get it done. I then found a group of rug hookers in Shubenacadie, Nova Scotia, not far from where I lived. What a fun group! They provided lots of help for first time rug hookers and that made all the difference. I soon finished my rug and went on to project number two. 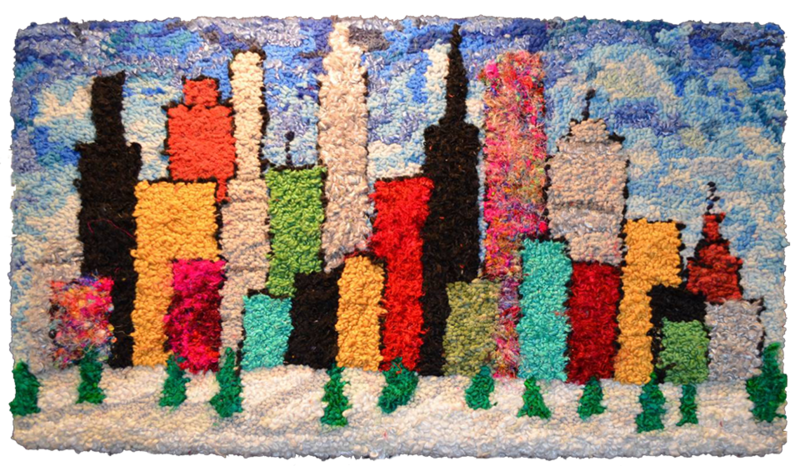 Visit the Gallery and the Animated Rugs Pages... and don't miss our Blog! You will find other rugs featured in the past!